Today is Earth Day and what better way to celebrate the earth than to try and protect it? 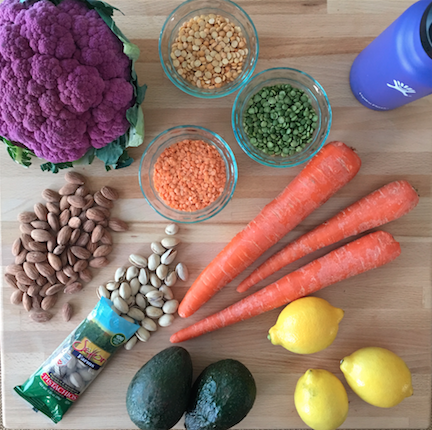 Sara Siskind, Certified Nutritional Health Counselor and founder of Hands On Healthy has come up with 6 ways to help our planet thrive by making small changes to our eating habits! Who knew we could help the environment by eating! No matter if you use these tips for cooking, or to keep your health and fitness goals alive, small daily changes = big impact! 1. Add more plant-based protein into your diet. Industrial farmed meat has a higher impact on the environment than any other food group. For a healthier and more environmentally friendly protein, try beans, legumes, nuts, and seeds instead. Lentil soup is an excellent source of protein and fiber and is simple to make. I also top my homemade salads with Setton Farm Pistachios and Pistachio Chewy Bites, which are filled with heart healthy fats and protein to keep your energy levels up throughout the day. Another thing I like to do is add tahini to my roasted vegetables to turn a side dish into a meal. What Your Grocery Shopping Trip Has Been Missing! Recently I’ve totally been slacking on remembering to bring my shopping bags in with me when getting groceries! You’d think I’d be disappointed for forgetting because of the discount most stores will give you for bringing your own bags, but it’s not, at least not for me. No, once I pick up my cart and walk into the store and realize I once again forgot my bags, I’m shaking my head because I realize how many more bags my lazy bones will have to be carrying into the house (and how many more trips I’ll be taking up my third level apartment steps, to bring groceries back from my car! 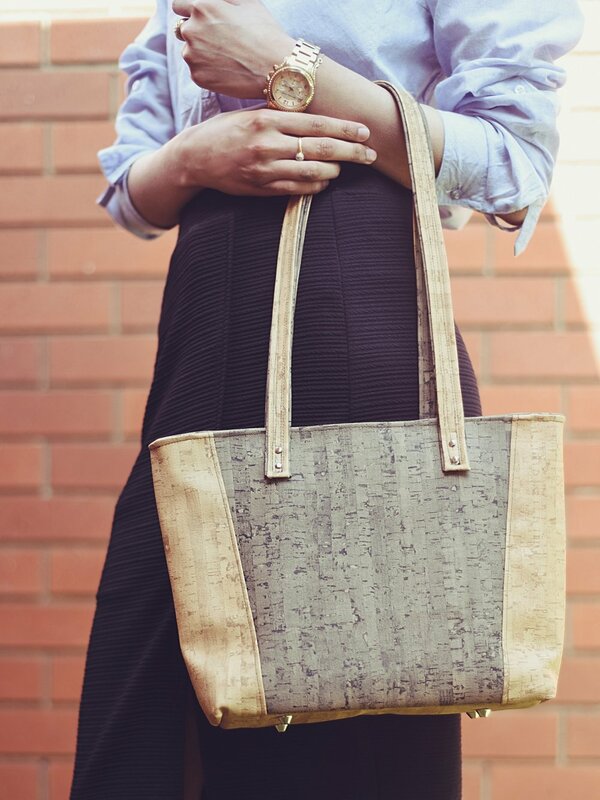 Shopping bags are not only better for the earth they’re better for you! Carrying lots of heavy bags up stairs in awkwardly shaped plastic bags can be total torture on the fingers, hands, back, and even legs as that half gallon of soy milk keeps smacking you in the leg! I’ve been using shopping bags religiously (when I remember) for a few years now and they are nothing short of amazing! I can take in less bags, make less trips to the car (I can almost always get everything in just one trip, no matter how much I’ve bought!) and a lot of them come with cooler bags that you can use to keep your frozen and refrigerated food cold for that much longer! I have however, made the mistake of thinking that all shopping bags are created equal. Boy could I have not been more wrong in that way of thinking! I quickly discovered just how wrong I was after recently trying out an amazing eco friendly reusable shopping bag set (and one that is totally unique from the rest!) from TheHappyCart. These shopping bags are wayyy different than other shopping bags out there. 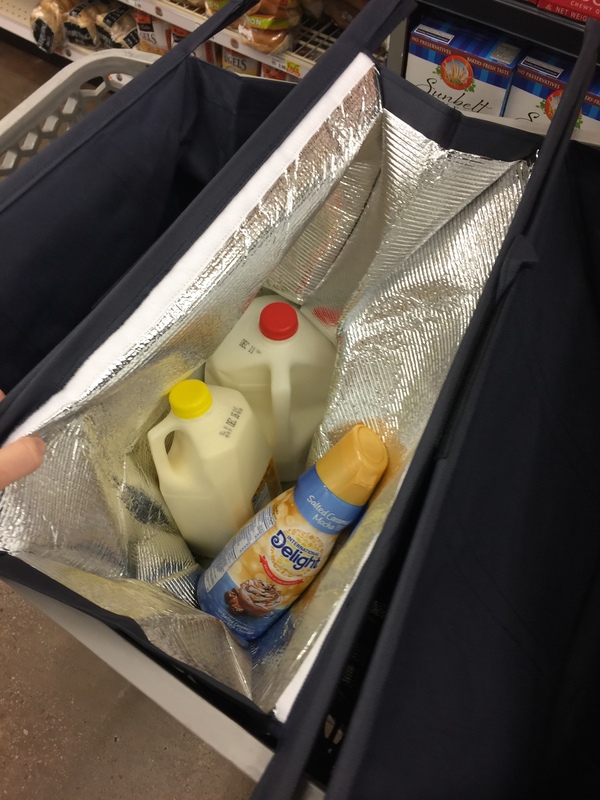 You get your nice conveniently large shaped bags that are good quality, strong and durable too, and you also get the bag that is great for keeping your cold items cold as well, but those aren’t the only wonderful things about it! No! 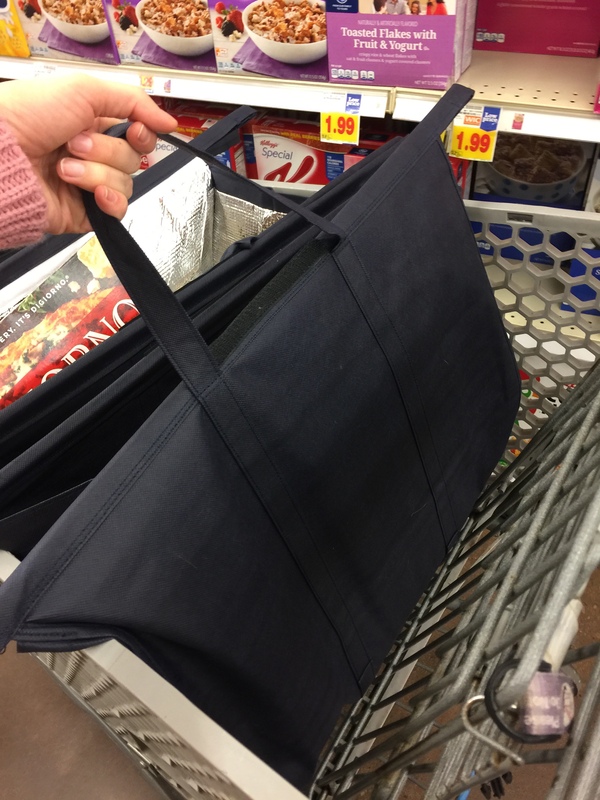 These bags are made to fit your cart (it hangs over the sides- see pics attached to get a better idea) and it makes it that much easier shopping, unloading onto the checkout belt, loading into your car, and unloading and carrying and unloading in your house. And they are even bigger than your other shopping bag set! 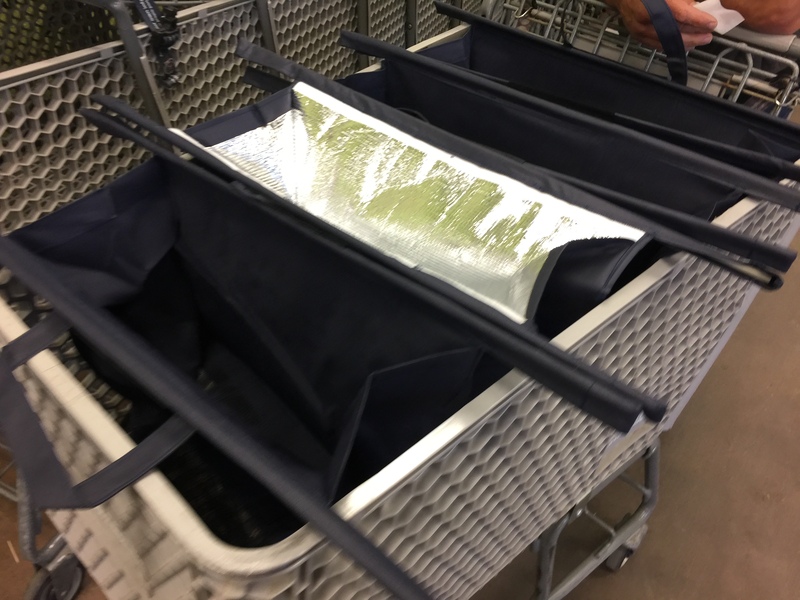 I love that when using my shopping bags from the HappyCart, I can load my cold items right into my cooler bag, to keep them cool while I’m doing my shopping! I no longer have to pay attention to what part of the store to start out first and what part (the frozen isle) to save for last! 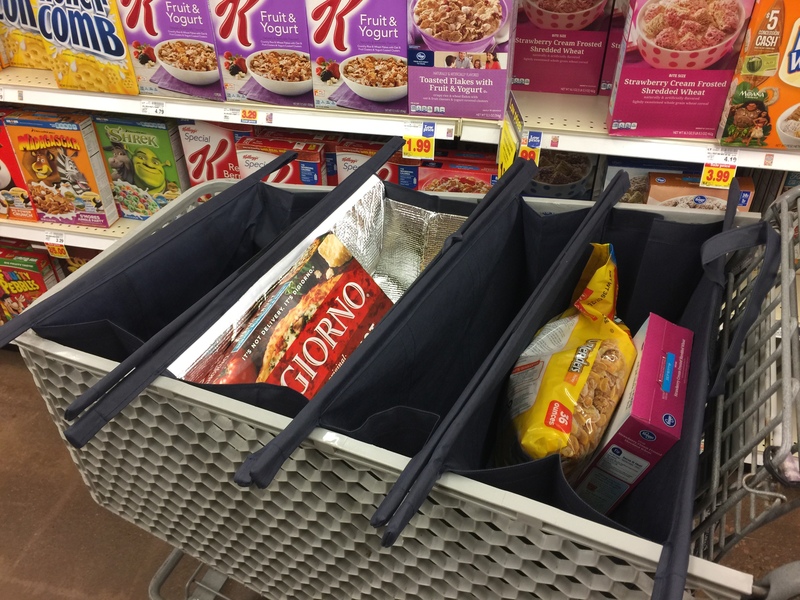 These bags also take up the entire cart, so they keep you organized too, and you can easily see where things are in case you change your mind a few isles later or see something better. This also allows me to keep my bread separate so it doesn’t get squished in the cart, which I’ve always been known for doing! Oops! Oh and one of the best parts! They totally Velcro together so you can take in as few or as many bags as you like, organize them in the order you like, and keep them together nicely too. Oh and they zip shut too, so you don’t have to worry about anything falling out while lugging your groceries into the house. These shopping bags are pretty amazing right? I also love that when they’re not in use, they lay perfectly flat so they store easily in my pantry or my car. Interested in picking up some HappyCart shopping bags for yourself? Shop it Here on Amazon. What are some of your favorite aspects of the shopping bag over the plastic bags from the store? Let me know in the comments, I love hearing from you! Also, please be sure to follow MyStyleSpot on Facebook and Instagram, to stay up to date on all things shopping!